Light pipes (aka light guides) are widely used in automotive instrument panels, aircraft avionics, consumer electronics, and many other applications. 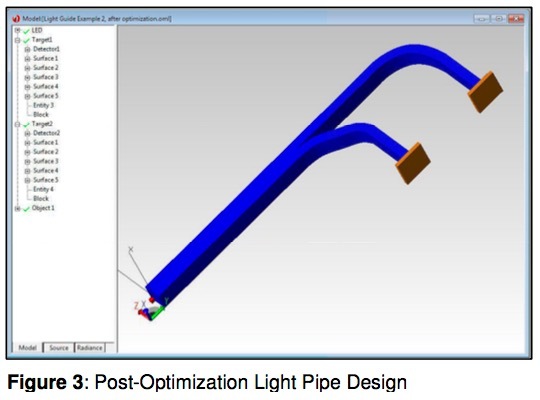 Design engineers integrating light pipes into their product design have requirements for the uniformity, color, efficiency, and lit appearance of the output face of the light pipe. The steps necessary to achieve these requirements involve a myriad of variables that must be carefully considered in order to reach the proper end effect. 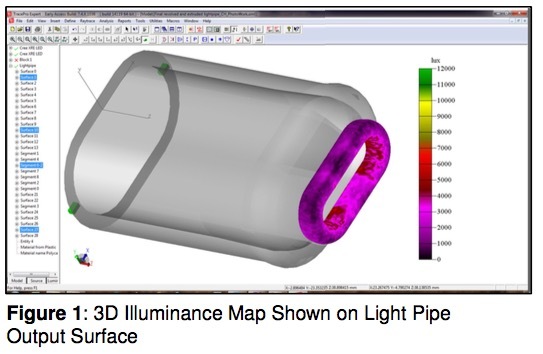 Unlike basic luminaires, the optimization of light pipes is uniquely challenging due to the complexity of singular or multiple light sources, geometric shape, and the effects of surface and material properties. 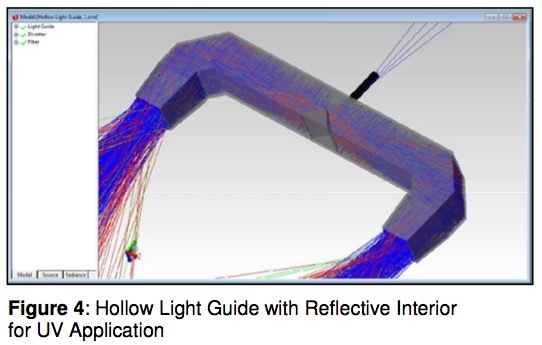 The art of light pipe design involves the clever use of Snell’s Law, Fresnel Loss, Total Internal Reflection (TIR), mirrors, and other optical principals to “channel” light from the source to one or more target objectives with maximum efficiency, desired color, and uniformity. Materials, surface properties, shape, and light source characteristics also contribute to effective light pipe design. 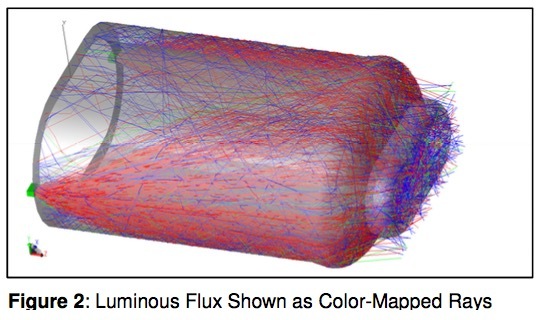 TracePro provides all of the tools necessary to design, sketch, analyze, optimize, and visualize intricate light pipes. The designer starts with a basic design, digitizes variable limits directly into the CAD sketch utility, and establishes desired illuminance, luminous intensity, color, and/or uniformity parameters. 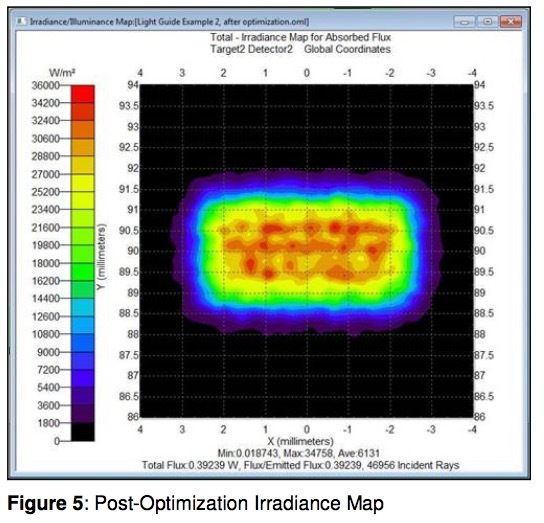 TracePro’s light pipe optimization is accomplished by creating a merit function based on singular or multiple operands (targets) with weights to balance the operands’ importance to the optimization function. A macro language is incorporated into the optimization utility to control and vary light pipe creation. The macro language adds Boolean operations, translation, extrusion, and revolution of geometry; and incorporates user-defined variables for iteration of geometry, temperature, and positional changes to the base model during optimization. Design parameters, efficiency, illuminance, color, angular, and uniformity output can be monitored through every step of the process. Whether your design involves LEDs or traditional lamps, TracePro has the performance, accuracy, resources, and utilities to help you produce stunning results.